Southern Bricks March 2019 Iron Builder Gallery! Brixpo 2019 applications are now open! SBLUG Iron Builders for February 2019! Happy New Year from Southern Bricks! Event Round-Up News! 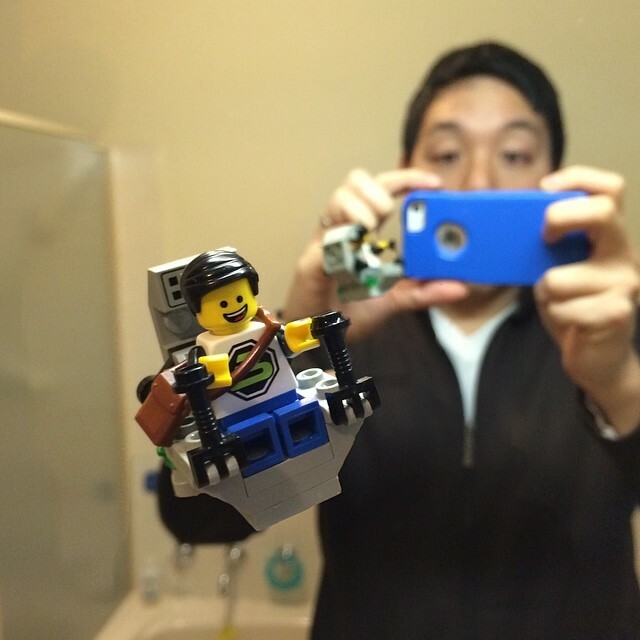 Trying to capture your LEGO minifigures in action? Here are a handful of tips on using your phone to take photos of little plastic people! I’ve been taking photos of LEGO minifigures for just over a year and while I now use a ‘proper’ camera, I started out with the camera on my phone. To be honest, the cameras in smartphones are getting better and not only that, the default camera apps aren’t too shabby either. These tips are for the default camera iOS camera app, but should also work for most camera apps out there. There’s also a bunch of other camera apps for iOS and Android that specialise in macro shots, but I really like how quickly I can open the iOS camera from the lock screen and it’s an app that’s matured into something that rivals even some of the paid options. I’m not a pro, but there are some key things that you’ll need to learn if you want to capture great moments. Good photos aren’t dependent on the technology. Learning about things like composition, rule-of-thirds, the use of perspective and depth-of-field are just a few places to get started. There are plenty of resources online to help you such as Digital Photography School and the DPReview Forums. It doesn’t take much for your phone’s camera to get dusty or grimey and giving it a good wipe before you start shooting can make a world of difference. I’d recommend keeping a small lens wipe on you for when you’re off on your photography adventure. Lighting is key. Often the cameras on phones don’t do that well in low-light, so make sure you either work with your surroundings and find a well-lit area or provide some of your own light. But don’t overdue it. Working with minifigs means you’re taking photos of what can be very reflective ABS plastic so direct midday sun or flashes may cause glaring, over-exposed highlights. Playing around with the direction and intensity of your lighting can also give you a different feel/effect to your photos so if you can, play around with angles and positions until you get something you like. One of the joys of shooting photos on a smartphone is that it’s very simple to choose what you want to focus on – simply touch the screen and the camera will try its best to focus on whatever you’re touching. This makes getting nice, sharp images a little easier but on such a small subject, your camera may try and focus on something else – and it can be the most frustrating part of using a smartphone to take macro photos. Steps 3-8 give you a few more tips on focusing. To make sure the camera stays focused, you can lock the focus by touching where you want to focus and holding down for a second or two. You’ll then see the indicator for the AF-AE lock being turned on. When it comes to shooting macro, the temptation is to get as close as you can to the subject, but if your phone is having trouble focusing, you may be too close. Try moving back a bit and trying again. I’ve found that I need to be at least 8.5-9cm (3.5-4in) away for it to focus sharply. First I’ll touch the screen to focus. Usually this takes a few goes to make sure the camera gets it right. Once I’m happy with it, I’ll touch the screen again but this time hold my finger on the screen to lock in the AE/AF. Next, I’ll check that the photo is as sharp as I’d like it. If not, I’ll move the phone back/forwards to get the focus right. Then it’s time to take the photo. It can be a little tricky getting the focus sharp, especially when you’re working with a small screen. To make it easier, sometimes I’ll start by zooming in as far as I can and then following the previous steps but before taking the photo, I’ll zoom back out again. I’ve found this works well, especially when there’s a busy background or a lot of other objects in the shot that the camera may want to focus on instead. By zooming in, you’re reducing the other ‘distractions’ for the camera so it knows what to focus on. Ok, well let’s say you’re still having trouble focusing on your subject, try telling your camera to focus on something else that’s the same distance away as your subject. Finally, camera shake can be the final enemy when it comes to taking macro photos on your smartphone – especially in low-light situations. Start by picking up a smartphone tripod. I use a JOBY Magnetic Gorillapod with a cheap smartphone mount I picked up at Ted’s Camera. JOBY also now do a range of smartphone tripods that may be worth looking at. 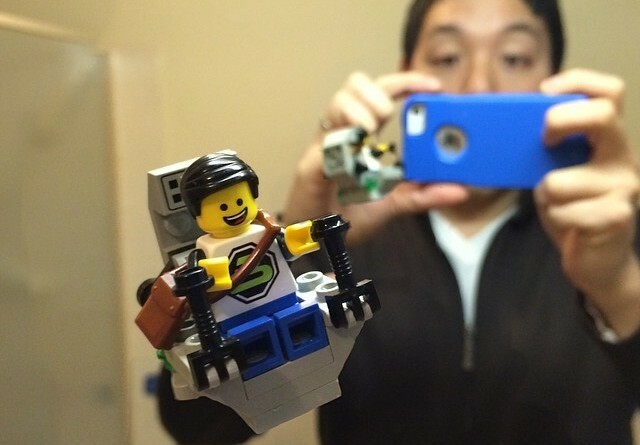 Question: Do you have extra gear to shoot #Lego photos with your smartphone? I’ve been playing around with a cheap smartphone mount and a @Joby GorillaPod and pretty happy with the portable setup. Timer: First up, try using the timer. On the iOS 8 Camera app, you can choose 3 or 10 seconds. This gives you time to press the button to take the photo, but be hands off when it actually fires. Remote switch: Take your hands off the phone completely and use a remote switch. The easiest option would be to use the earphones you got with your iPhone. The volume switch acts as a shutter-release so you don’t have to touch the phone once it’s set up. Alternatively, you could buy a cheap Bluetooth remote switch fairly cheaply from eBay and use that too (I think you can also use the volume controls from a Bluetooth headset if you have one). See the full article with on Brickpixels.net with more examples of LEGO photos taken with a smartphone. Taking pictures of mini plastic people in public places. LEGO, the LEGO logo, the Minifigure, and the Brick and Knob configurations are trademarks of the LEGO Group of Companies. ©2015 The LEGO Group. Copyright © 2019 Southern Bricks. All rights reserved.